Each unique. Natural stone and crystals in an everyday item. What better way to dress up your bar and hor d'ouevres and charcuterie? Perfect registry item for wine and cheese lovers. The rustic yet chic shape of the olive oil can looks clean and sophisticated in your kitchen. Handformed in Tuscany of Italian stoneware. Microwave, oven, freezer, and dishwasher safe. Also available in aqua & grey. 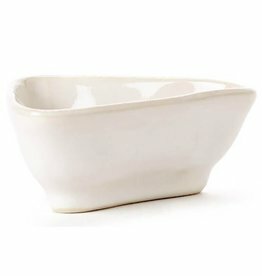 8.75 " high Add a rustic, chic addition to your dinnerware collection with the Lastra White Vinegar Can. Pair with your favorite bottle of balsamic vinaigrette for a thoughtful gift all year round. 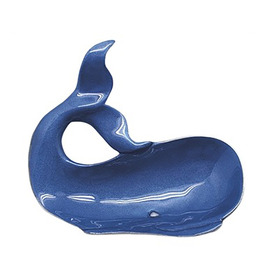 Cobalt Whale Dip Dish. Cutest thing we’ve ever seen! Irresistable. A very happy and satisfied pig, Vagabond House's detailed farm yard friend brings cheer to your table while keeping your butter fresh and cool. The figural pewter lid rests upon a stoneware butter plate. The perfect white piece to use for your favorite olive oil! 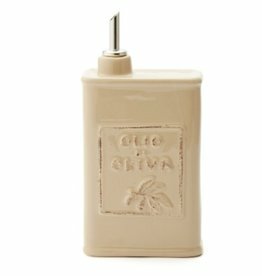 The Bianco handled olive oil can is handmade of terra cotta in Tuscany. Dishwasher safe. The stopper is made from cork. Also available in Sorbetto Aqua and Crema. 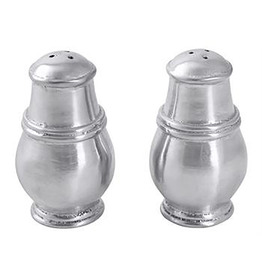 Rustic yet chic, the Lastra white salt and pepper set add a clean and sophisticated feel to your table. Lastra's design is inspired by the molds used to form Italian cheeses. Made in Tuscany of Italian stoneware. Each unique. Natural stone and crystals in an everyday item. What better way to dress up your bar and hor d'ouevres and charcuterie? Coated reed hand-woven in the Philippines, and includes the glass dishes for sauces and condiments, making a handsome yet casual presentation. Add a rustic, chic addition to your dinnerware collection with the Lastra Cappuccino Olive Oil Can. Pair with your favorite bottle of Olive Oil for a thoughtful gift all year-round. Sophisticated and fun. That’s kate spade! Perfect for a shower gift or for that young women setting up her very first place. Stoneware. The Forma Cloud Triangular Dipping Bowl is handformed in Veneto, Italy from the strongest Italian stoneware. Fill the dipping bowl with soy sauce and pair it with the rectangular platter for sushi night! With a handsome, timeless design, our softly polished Classic Salt and Pepper Set complements a wide range of dinnerware. 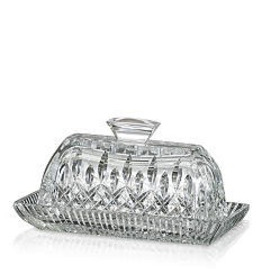 Our softly polished Classic Gravy Boat is characterized by a traditional shape. An elegant addition to gatherings all year round.